Effektif makes it easy to build a business process that contain human tasks, with its form builder and configurable work-flow. However, automating these business processes requires systems integration as well. Managing human tasks is an important part of business process support, and there are tools that focus on this side of things, such as Asana and JIRA. Meanwhile, integration frameworks and platforms address interaction between systems without user tasks. Business process management is the result of combining both human tasks and interactions with systems. In fact, in enterprise software development is all about enabling multiple people to interact with multiple systems as part of a single process. 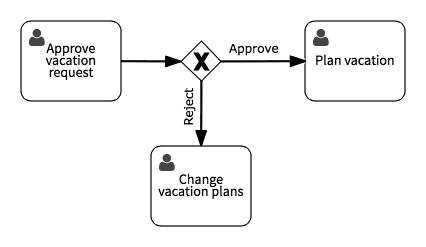 After starting the process, and completing the Approve vacation request task, Effektif’s ‘case stream’ shows what happened. 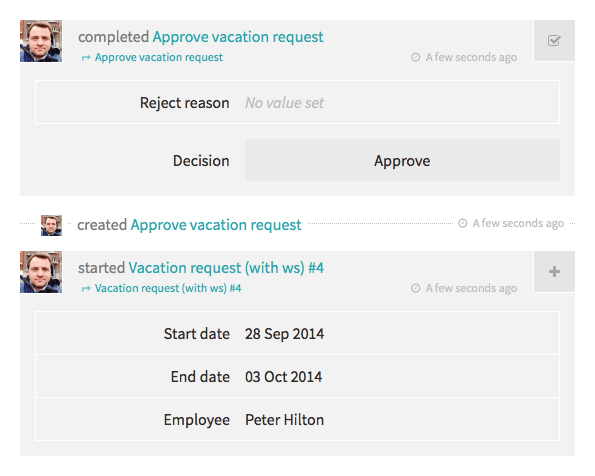 You can use this functionality to co-ordinate vacation requests, recording both requests and decisions. However, this only works if you want to use the built-in user interface to manage this process. In practice, especially for more complex processes, there are existing systems for managing aspects of the process, such as providing visibility of current and historical requests. In this case, you would need to integrate Effektif with a back-end system. 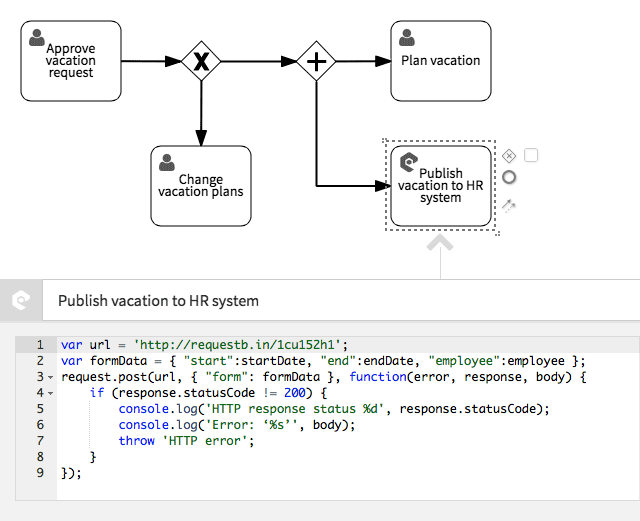 For this example, we’ll need a test server to represent an external system that we will send vacation requests to. This means inspecting HTTP client requests - we can use RequestBin to create an endpoint such as http://requestb.in/1cu152h1 for debugging. The next step is to run the code, and inspect the results. You can also use the code editor to enter test data and test the code. After entering test values for the mapped variables, click the Test it button to run the code and get the following output. This shows the values of the form-encoded data sent in the request. When the HTTP response is not a success (status 200), the callback writes to the console and throws an exception. For example, suppose that an evil HR system starts rejecting requests with an All vacation is cancelled! error, then executing the process will result in the following output in the Effektif case stream. The exception results in the red icon (top-right), and the console logging is also shown.